Modern bathroom design trends help to choose materials and bathroom furniture, fixtures and bathroom decor accessories for your bathroom remodeling. Consider helpful designer tips and popular bathroom decorating ideas for your bathroom renovating, decorating or home staging project. Contemporary, traditional and eclectic styles are modern bathroom design trends. Popular bathroom remodeling ideas include latest floor and wall tile designs, bathroom tubs, faucets, fixtures and hardware. Look at photographs of designer bathrooms and use most popular ideas for your bathroom remodeling. A simple modern bathtub looks strikings in a spacious bathroom, bringing a sculptural form into modern bathroom design. Painted shutters and limestone tiles on bathroom walls and floor create a Zen atmosphere in the bathroom, adding attractive color contrasts, created by rich interior paint color and light tile designs. A wooden stool and patterned floor rug add a universal appeal and organic touch to modern bathroom design and decorating. 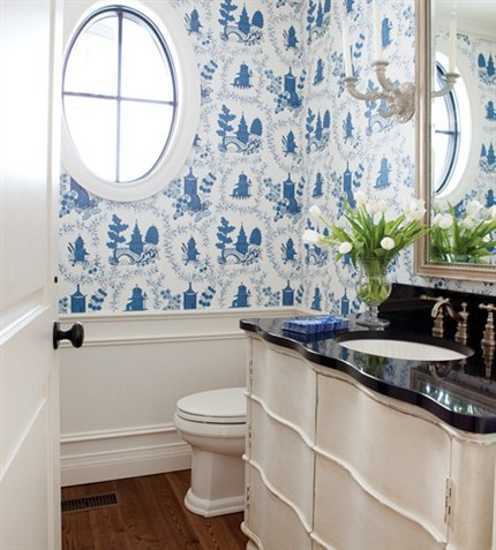 Modern bathroom wallpaper designs with blue patterns add fun and style to your white bathroom walls. A simple chest cabinet in white color, decorated with metal knobs that match an elegant wall mirror frame, creates a fresh, attractive and comfortable look. A sink, built into a chest and topped with marble, looks luxurious with a decorative glass vase and shiny bathroom accessories. 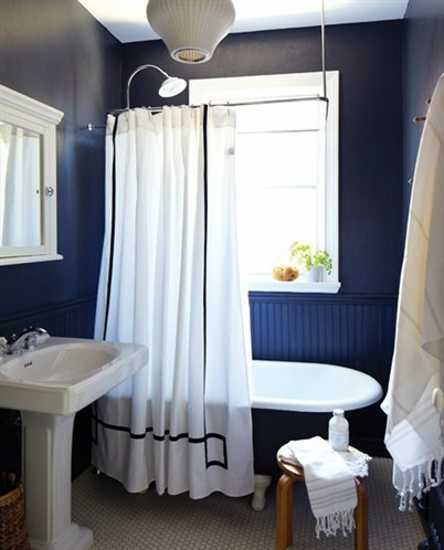 A bathroom tub and white walls can be painted in deep blue color shade for creating dramatic effect and adding an exciting color contrast to modern bathroom design. The white medicine cabinet on the wall and interesting pendant light in white colors, combined with white bathroom towels create a spa like, bright and peaceful look. 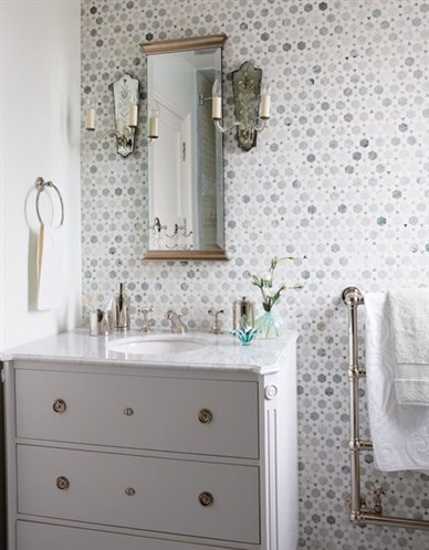 Vintage style sconces are a nice way to add character to modern bathroom decorating ideas. White interior paint, black and white decorating ideas, white bathroom furniture and lighting fixtures increase the size of small bathroom design, offering spacious and pleasant bathroom remodeling ideas.